If you live outside of the U.S. and enjoy listening to customized radio stations on Pandora, brace yourself for some bad news. The site will be shutting you out starting Thursday evening. Registered users who access the service from outside the U.S. received a warning email yesterday letting them know that this will be happening. 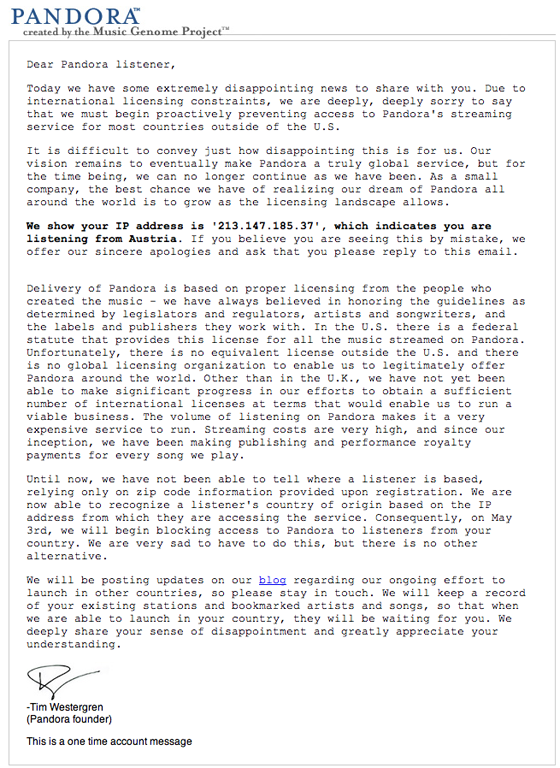 Pandora operates under Section 114 of the DMCA, which gives them a clear process for paying rights holders in the U.S. There is no international equivalent of the DMCA, and so to operate legally in other countries, Pandora must sign deals with rights holders directly. That means separate deals with labels and publishers for each song, an extremely difficult and time consuming task. Pandora has always made it clear on the site that it is for U.S. users only, and requires a U.S. zip code for registration. That didn’t stop many international users from registering anyway, using “90210” or another famous zip code to get access to the service. Now, with IP-based filtering, users will be forced to go through proxy servers or other complicated mechanisms for getting to the music. I spoke with CTO Tom Conrad this evening about the change. He says Pandora has been working on international rights deals for nearly two years now, and they hope to have enough deals done in the UK and Canada to launch in those countries soon. Other markets will take longer, he says. The email sent to users is below. This isn’t the only bad news recently for Pandora. Along with other Internet radio companies, they have also been fighting the RIAA over revisions to the fee structure they must pay for playing music online. The rates they pay are significantly more than satellite providers pay, and terrestrial radio stations pay nothing to play music. Two very brave congressmen, Representatives Jay Inslee (D-WA) and Donald Manzullo (R-IL), have proposed legislation that would require Internet radio startups to pay no more than satellite providers, which should allow many Internet radio startups to stay in business. Read more about the legislation on the Pandora blog and SaveNetRadio. We’ve covered Pandora since their launch in the summer of 2005. Our coverage is here.